Orchestration: An Anthology of Writings is designed to be a primary or ancillary text for college-level music majors. Although there are several 'how to' textbooks aimed at this market, there is little available that traces the history of orchestration through the writings of composers themselves. 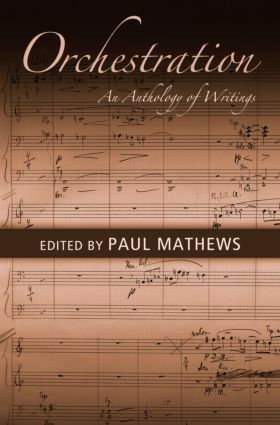 By collecting writings from the ninenteenth century to today, Mathews illuminates how orchestration has grown and developed, as well as presenting a wide variety of theories that have been embraced by the leading practitioners in the field. The collection then traces the history of orchestration, beginning with Beethoven's Orchestra (with writings by Berlioz, Wagner, Gounod, Mahler, and others), the 19th century (Mahler, Gevaert, Strauss) the fin de siecle (on the edge of musical modernism; writings by Berlioz, Jadassohn, Delius, and Rimsky Korsakov), early modern (Busoni, Schoenberg, Stravinsky, Grainger, and others), and high modern (Carter, Feldman, Reich, Brant). Many of these pieces have never been translated into English before; some only appeared in small journals or the popular press and have never appeared in a book; and none have ever been collected in one place. The study of orchestration is a key part of all students of music theory and composition. Orchestrationprovides a much needed resource for these students, filling a gap in the literature.